Call us at 001855-700-0890. Our customer support team will be happy to assist you. Getting engaged and married are two of the most important occasions in your life. These occasions are traditionally marked with the purchase and giving of engagement and wedding rings. Part of the fun in planning this big step in life is to choose your rings. When wedding jewelry is designed and created by the loving couple, it becomes even more special. GLAMIRA is a successful European online jeweler which designs and crafts its own ranges of fine jewelry with input from its customers. Year on year GLAMIRA is building on its success in Europe bringing the benefits of its online jewelry store to an increasing and appreciative customer base who appreciate the label's fine jewelry. A strong selling feature of the brand, a USP which draws in its customers, is the chance it gives you to create truly special and personalized jewelry for your loved ones. And as future special occasions come along what better way is there to celebrate your ongoing love by giving custom jewelry of rings, necklaces, and cufflinks as wedding anniversary gifts? 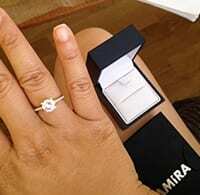 To start creating beautiful engagement and wedding rings or stunning pieces of jewelry for special birthdays, occasions and anniversaries take a browse through the GLAMIRA website. Start by exploring its women’s jewelry pages which give you sparkling and inspirational ideas for all occasions. Why not let GLAMIRA help you design an engagement ring to mark your wedding proposal? 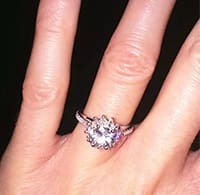 In the process, you'll be creating a totally unique engagement ring that your fiancee is sure to treasure forever. Traditionally, engagement rings have featured yellow gold bands set with a solitaire diamond but try breaking away from convention and choosing imaginative and effective combinations from GLAMIRA such as white, yellow or rose gold engagement rings set with its range of stunning and valuable precious and semi-precious stones. If you want something that's even more unique choose the semi-precious stone that marks your partner's birth month. Emerald cut engagement rings can sit in settings of platinum or white gold or a pleasing combination of white and yellow gold together. Emeralds also work well alongside diamonds giving you the inspiration to create diamond engagement rings with a difference. If your heart is set on a diamond, however, then princess cut engagement rings are really designed to show off the depth and quality of the stone used, giving a more modern finish to a classic solitaire ring. Cushion cut engagement rings also give a contemporary look to single diamonds with their soft finish of rounded corners and sparkling facets. If you want real luxury and timeless elegance then you can't do better than proposing with a platinum engagement ring set with a flawless GLAMIRA diamond. 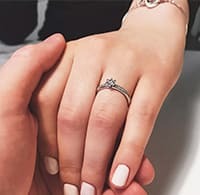 By working with GLAMIRA to design the perfect engagement ring you can propose in style and celebrate your engagement by showing your loved one how much you care. 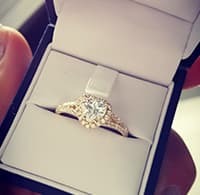 The idea of engagement rings as part of a marriage proposal has been around since Ancient Roman times when simple iron bands were often exchanged. A few centuries later during the Middle Ages, the aristocracy gave rings to mark the reading of marriage banns a few weeks before wedding ceremonies took place. 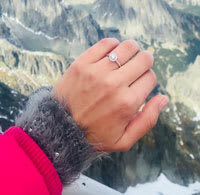 Diamonds began to be a feature of engagement rings in the 19th century and by the early 20th century diamond engagement rings had established a firm root as a traditional part of marriage proposals with brides loving the idea of wearing a diamond. Your diamond ring from GLAMIRA can have a band of high-quality white, yellow and rose gold or deluxe platinum in your choice of karat, with styles featuring one solitaire diamond or several stones. Modern and pretty halo and square-cut settings sit alongside traditional designs to create a truly beautiful collection of both classic and contemporary diamond engagement rings. GLAMIRA presents a stunning collection of engagement rings which will definitely pander even the most sophisticated taste. Being the most popular gemstone, a diamond will help you express your feelings set into various design options, metals and stone settings, among which even the most experienced fashion lovers will find their ideal one. To create the perfect engagement ring for your loved one, start with choosing her favorite diamond shape from classical round brilliant to fancy diamond cuts including emerald cut, oval, heart and pear. Once you decide which stone to use, you can choose from various precious metals and designs to go perfectly with your proposal plans. When special occasions such as birthdays and wedding anniversaries come round, remember to celebrate by creating stunning diamond jewelry to complement her engagement ring. Have a browse through the full GLAMIRA range of diamond earrings, necklaces and brooches, as well as stunning diamond bangles and collars showcased on its website. Giving your loved one a beautifully personalized ring from GLAMIRA shouldn't just be kept for engagements and anniversaries. Show you care at any time of the year with traditional and contemporary GLAMIRA designs in diamond rings, or if you love jewelry treat yourself and browse through the eye-catching collections of custom rings and create a piece that you'll treasure forever. 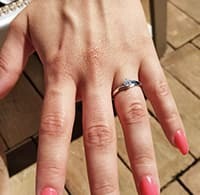 An eternity ring has long been used as a symbol of everlasting love, often given by husbands to their wives when new additions to the family are celebrated or after several years of happy and contented marriage. GLAMIRA has rings for women in eternity designs that feature full or half settings of small diamonds or a choice of gold rings set with precious or semi-precious stones, such as black diamonds emeralds, rubies and aquamarines. Emerald rings in a setting of simple white gold look particularly stunning while platinum rings in matched eternity sets for men and women are a charming way to celebrate signature anniversaries and demonstrate the strong and abiding love you have for each other. Necklaces from GLAMIRA give you the perfect finishing touch to any outfit from casual jeans and shirts to red carpet or cocktail dresses, bringing a luxurious sparkle to any occasion. Adding a GLAMIRA pendant to a fine gold or silver chain creates a thoughtful gift with a personalized touch. With the wide range of GLAMIRA pendants available, from adorable birds, animals and angels to touching hearts and other quirky designs, it is so easy to create personalized necklaces with your choice of chain color, setting, and decorative precious and semi-precious stones. If you want to introduce a real touch of sparkle, add some Swarovski crystal details to your custom necklace from GLAMIRA. Pendant necklaces are set off perfectly when used to accessorize wrap blouses, fitted shirts, and low-cut evening dresses or add a glamorous touch when worn over plain cashmere jumpers or knitted dresses. A delicate heart necklace from GLAMIRA is the perfect way to mark Valentine's Day. Choose chic and elegant designs of single hearts or interlocking hearts that demonstrate your love for each other, or pick styles heavily embellished with colorful stones and crystals. To celebrate Mother's Day let GLAMIRA help you create a pearl necklace, in a classic and timeless style that will be loved by this most important person in your life. Choose a white or yellow gold necklace chain and adorn it with your choice of black, white or rose cultured pearls. All women love earrings whether they're subtle studs for everyday wear or stunning shoulder-grazing designs for cocktails and special occasion dressing. Diamond earrings make the most of a 'girl's best friend' and with their varied cut, color and clarity, it's easy to find GLAMIRA earrings that suit every skin tone and hair color, adding a welcome sparkle to anyone's day. GLAMIRA diamond stud earrings can be barely-there drops of high-quality diamonds or fun and quirky designs featuring arrows, hearts, and floral swirls. Pearl earrings matched with pearl necklaces are totally flattering, drawing out the best in skin tones and reflecting light onto your face. Pearls also work well with other stones giving elegant and fun combinations with emeralds, sapphires, and rubies in drop earrings or simple stud designs. Pearl drop earrings combined with diamonds are particularly effective with little black cocktail dresses, adding a subtle sparkle and lightness of tone to elegant evening outfits. Gold earrings are always popular, suiting everyone from young children to more mature women. Create the perfect design for your loved ones by mixing and matching gold earring settings in classic or contemporary cuts with the colorful range of stones showcased at GLAMIRA, or be totally on-trend with hoop earrings in catwalk inspired styles of white and yellow gold mixes or designs sparkling with aquamarine or tanzanite stones. Whichever style of jewelry you've chosen for the woman in your life, a leisurely browse of GLAMIRA's designs will inspire you to get creative. Men have become increasingly confident about branching out into jewelry with choices being made beyond the traditional pairing of watch and wedding ring and clearly demonstrating that these days jewelry isn't just for women. Most men now choose to express their love and commitment by wearing men's wedding bands that match the wedding rings of their brides. If your wedding proposal was made on Leap Year's Day why not continue the unconventional theme and give your life partner a men's ring in wide engagement band of yellow gold or platinum? Choose inset settings of fine diamond chips or stand-out cubes of black onyx edged with little square-cut diamonds. Men's diamond rings add a strong statement to any outfit, looking particularly effective when paired with sharp suits or evening wear while men's gold rings inspired by classic signet ring designs or with a twisted Celtic style decoration make strong fashion statements with both casual day wear and more formal dressing, or even wedding rings with a difference. Sometimes knowing what to buy the man in your life for Christmas, birthdays or other celebrations is difficult, but cufflinks are always an inspired choice and a very on-trend accessory at the moment. GLAMIRA presents contemporary and business like cufflink designs. Why not explore the website and create gold and diamond styles to match your husband's personalized wedding band? One of the most romantic parts of the wedding ceremony is when the happy couple exchange their wedding bands. Shopping together for bridal sets that express love and personality is a fun part of wedding preparations. By choosing from the elegant range of GLAMIRA wedding jewelry, you create designs that not only celebrate your love but will last a lifetime. Decide whether you want unique and personalized women's and men's wedding rings or beautifully crafted matching wedding bands and then make them even more special by letting GLAMIRA engrave them with your initials and wedding date. Husbands will have no excuse for forgetting wedding anniversaries when you choose engraved wedding band sets! Whether you choose platinum rings or wedding bands of white, yellow or rose gold, the enclosed circle has deep roots lost in Pagan times and strongly symbolizes your love for each other. Celebrate this tradition with circles in Celtic designs or pick plain unadorned bands. Many couples choose to combine engagement and wedding rings into one, if this is your choice GLAMIRA diamond wedding bands are just perfect. GLAMIRA is for you if you love unique jewelry, whether it's for engagements, weddings or other special life events. GLAMIRA makes it easy to create your design with its choice of settings, stones and cuts and guides you gently through the design process from measuring ring size to jewelry delivery, with friendly advice always available online or by phone. Put the pleasure back into choosing jewelry with GLAMIRA.